October 2017 is National Physical Therapist Month. Personally, I wish everyone would celebrate and salute all PTs every day. They truly are lifesavers. It’s an honor to be one and to work closely with so many. People don’t often think of physical therapists until they need one. But just like military personnel, doctors, nurses, firefighters, paramedics and many others, PTs are always there. They dedicate their lives to helping others. If you see a physical therapist, please thank them for their service. This month, and always. Almost everyone has received physical therapy or knows someone who has. Physical therapists work their magic every day, often ‘invisibly’. We here at Jet PT Billing have the opportunity to work with many dedicated physical therapists who spend their days helping people to recover from painful injuries and debilitating conditions. Sometimes the work takes a few consultations, and sometimes it takes months to help someone relearn everyday things we take for granted, like bathing, washing dishes, and putting on shoes. PTs help athletes get back into playing shape, assist patients regain movement after surgical procedures, and even help soldiers who have lost limbs to cope and thrive again. National Physical Therapist Month was originally established as Physical Therapy Week by the American Physical Therapist Association in June of 1981. In 1992, it was changed to an entire month dedicated to physical therapists and all that they do. Furthermore, it was moved from June to October. The goal is to raise awareness of all that physical therapists do. Each year, the National Physical Therapy Association chooses a theme to celebrate National Physical Therapist Month. 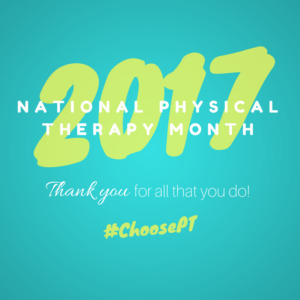 This year they unveiled the “#ChoosePT” hashtag to showcase the “Choose PT” initiative. Use this hashtag to show the world what physical therapy can accomplish and to spread awareness. This year sees a particular focus on the epidemic of opioid addiction and overdose, and the connection to physical therapy and pain control. Through hands-on therapy and exercise, PT plays a huge role in curbing the overuse of, and addiction to, opioid drugs. Give a shout out to your physical therapist today on social media. Not just in October 2017, but anytime. To help celebrate, use the “#ChoosePT” hashtag as you share your story. Some clinics across the U.S. will participate in activities to help spread more awareness in their communities. Many will also provide free services in underserved neighborhoods. When you see a physical therapist, please say thank you and make their day. Better yet, make their month, their year, and their career. Celebrate their incredible work. We salute you, PTs. This month and always. Creative Commons Attribution: Permission is granted to repost this article in its entirety with credit to Jet PT Billing and a clickable link back to this page.